It’s the season for riding inside, and if you are considering whether to go with rollers or a trainer for your indoor sessions, the following information will help you make the right decision for your needs. Three qualities are central to a trainer or rollers that will perform well: quiet operation, road-like resistance, and good quality. First, and foremost, I highly recommend that cyclists select a high quality set of rollers or trainer with the needed features. You will notice poor quality or missing features every time you ride indoors, and since a trainer or rollers often last many years, you miss these features for a long time. 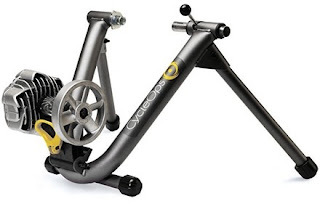 While a top of the line bike will add a few thousand dollars on top of what a basic racing bike costs, a top of the line trainer or rollers are only $100-200 more (not counting the computerized models that measure power or connect to a video game-like interface). 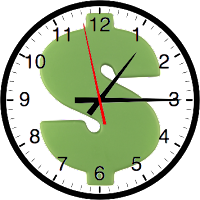 So spend the money—it’s worth it! Now that you know to bite the bullet and pony up a couple of extra Ben Franklins, the two things to look for are quiet operation and road-like resistance. Quiet operation is simple. Do you have other people living in your house or apartment building that you prefer not to drive crazy? Do you like to be able to hear music or the video you’re watching while riding? Then you want a quiet trainer or rollers. No model is whisper quiet, but some border on jet engine loud due to the mechanisms, fans, or vibrations involved. Higher quality models tend to use designs that are also quieter. Road-like resistance is the last characteristic to look for. When riding on the road, wind resistance increases exponentially as you go faster, and you want this to be imitated by your trainer. This graph shows how wind resistance increases with speed. I am a fan of fluid resistance because it imitates on-road resistance well, and as a result of the limitations of the other two popular mechanisms, magnetic and fan resistance. Fan resistance units do a good job of providing road-like feel, but they are really loud. Magnetic resistance is another mechanism used, and it is (usually) quiet but does not provide road-like resistance. As a result, magnetic units often have an adjustment knob/lever so you can increase it for harder workouts or decrease it for easier workouts. These adjustments either require dismounting to adjust or necessitate mounting the knob/lever at the end of a cable so you can reach it while on the bike, making for a more cluttered device. You may also see a combination of resistance units used on a trainer to take advantage of the benefit of each design and limit its disadvantages. With that background information, this Rollers vs. Trainer PDF gives the skinny on the ups and downs of trainers and rollers, plus some key traits to be aware of when shopping. SPOILER ALERT: After looking at the chart of pros and cons, it seems obvious to me that the best choice is a trainer for it’s safety and superiority in doing hard workouts. So why will you find me on rollers 90% of the time? 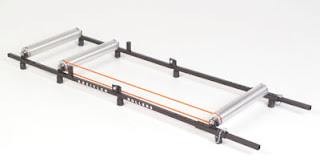 Because the balance learned riding rollers can’t be learned any other way, and because it feels like riding a bike outside as it moves more naturally under you, rather than held rigidly in place like on a trainer. From a coaching perspective, I highly recommend that riders learn to ride rollers, but it is hard to recommend them as a first purchase for new riders because they take a while to learn to ride and do have some inherent risks. If you have a few hundred extra dollars laying around, get both a trainer and rollers! My rollers are Kreitler Dyno-Myte (now called the Kreitler Alloy with 2.25” drum) , and I highly recommend them. They have excellent quality and respectable road-like resistance without having an extra resistance unit to attach. Riding really easy/slow is difﬁcult without a small gear on the bike (due to the high resistance of the rollers) but the resistance works pretty well for doing harder efforts (the Kreitler Alloy 3” provides a little less resistance). They have been very durable and long lasting—mine are nearly 20 years old and likely will last many more years. My trainer is a CycleOps Fluid 2, which I also highly recommend. They have very good road-like resistance, which has been great for workouts, and their fluid resistance design does not require any additional resistance unit or resistance adjustment. Like many trainers that clamp to the rear wheel, the Fluid 2 does require a strong and simple skewer for the rear wheel as fancy skewer knobs don't fit in the wheel clamp and even strong skewers can bend after many rides with the bike clamped in place well. I recommend finding and using a simple, steel skewer that you only use when riding the trainer (not on the road). If it bends a little, no big deal. The only other downside of the trainer is that it holds my track bike a bit off-angle (bike leans to one side) due to a track bike's narrow rear axle, but it works fine with my road bikes. Make sure you have a big fan (i.e. box fan) to use when riding inside as you will get extremely sweaty without one (two or more fans are even worth using if you have them). Don’t use your best tires while riding rollers and especially a trainer. The roller will polish then wear the tire out pretty quickly. 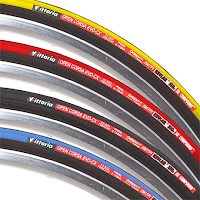 Cheap, wide tires usually last longest on a trainer or rollers and are worth buying to save your good tires and even reduce/prevent sticky rubber build up on the roller that happens with those great cornering tires. You can even buy special trainer tires designed specifically for a trainer, which are especially good for long trainer life and keeping the sticky stuff off the roller. Make sure to inﬂate tires before every ride to help prolong tire life, get the most consistent performance, and maintain the best contact with your tires and the roller(s). As the mercury heads south and you’re still heading out the door, it’s good to ensure that you’re dressed right. Aside from having cycling clothes that can keep you warm, it helps to know what combination of clothes works best for you. Enter the clothing log. That’s right, write down what you wore and when. You don’t have to document what you wear daily (see: my personal neuroses), but it is helpful to know if your warm pair of tights will keep you warm on a very windy 2 hour ride or if you will need more layers. The point is to write down what you wore so you will know what to wear again on a similar day. Include what the temperature, wind speed, and sun were like; how long and how hard you rode (easy, moderate, or hard is plenty); and how warm/cold you were (including specific body parts). I found that tracking this for roughly 5 degree increments in weather has worked great. Keep this list handy—maybe even in your training log—so you can refer to it each season. Above 50, I usually just wing it with what I wear, though, when I lived in Florida people wore long, thick everything at 55 degrees, so track the temperatures that are meaningful to you. Keeping a log starting with 70 degrees and everything cooler will make sure you know when to don everything from arm warmers to Iditarod attire. Below is a short version of my cold-weather-cycling clothing log. I hate riding outside much below 40 so no options are listed for that. This list may also give you some ideas of items to put on your wishlist, if you haven’t done that already. Option 1. Warm outfit for longer, easy-moderate intensity ride in sunny weather; have to temperature manage using zippers. If you missed the many track and field athletes during the Olympics who nearly missed qualifying for the next round by easing up before the finish line, then a reminder from one of sport’s wisest sages is in order. Oh, and this will drive the point home, too, if Yogi didn’t. 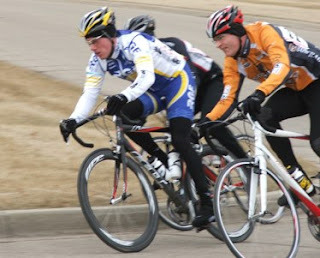 I love getting the opportunity to race two different categories at the same race: more racing for all that traveling. But for some reason I hate pinning on numbers. Maybe it’s because I’m picky about pinning numbers properly: not pulling awkwardly, tearing holes in my jersey, catching wind, poking me, closing jersey pockets, pinning my jersey and undershirt together, or being invisible to the camera. Whatever it is, I have found that pinning both numbers on at once saves me a lot of time the second time around that day. Just pin on both numbers, one on top of the other, then use a scissors to cut the first number off (super quick) or just remove one pin at a time from the top number, pull up that corner of the top number and replace the pin only in the bottom number—this avoids finding the right position again for the second number. The last couple of weeks many of us watched the many of the world’s best athletes during the Olympic Games. While they raced, jumped, lifted, hit, and shot through their competitions, the camera often caught their coaches giving advise or family and friends cheering them on. The athletes were competing with their teammates or on their own, but they definitely did not make it to the Olympics on their own. MSN has an article, The high price of raising of Olympian, which talks about how much time, money, and effort go into making a successful athlete. New bicycle racers (and their families) should be aware of the commitment needed to become the best. In addition to a lot of hard work, time, planning, focus, expertise, some talent, and a bit of luck, reaching one’s potential requires money, coaches, advisers, sponsors, equipment, teammates, mentors, competitors, and much more that an athlete cannot provide on their own. As you learn, develop, and progress as an athlete, look to include as many people as you can in your goals—the bigger the goals, the bigger your support group will likely have to be. Of course, as one of the parents in the article mentioned, if he’d have known how much it would take to support his son, he never would have done it. So maybe it’s best you don’t know ahead of time and just go for it. It’s wishlist time! No, the reindeer are not stopping by anyone’s house, but the time for end-of-year sales, team clothing orders, cold weather riding, and planning for next season will be here before you know it. You know you’ve been yearning for a set of super fast wheels, the newest supercomputer on a stem, and that ultra light, electronic, carbon-weave thing-a-ma-jig. Sure, add that to your list, but let’s be a little more practical than that. Will your bike fit next season? By fit, I don't mean “matches my team clothes,” but for juniors, will you look like you’re racing a BMX bike if you don’t get something that actually fits? If your bike doesn’t fit, it’s hard to ride at all, so add this to the top of the list—just be careful not to expect custom carbon. Next, take inventory of your gear. What tools, parts, spare items, or gear are you missing? Did you find that cheap chain tool doesn’t just fail to break a chain link but actually breaks the chain? Have you gone through all your spare tubes or worn down your training tires to the casing (or will soon)? Are you limping through the season with a shifter that got shredded in a crash? Take note of all these items, as they tend to be day-to-day gear you will most appreciate replacing. Short days and cold weather will be here all too soon. If you’re planning to ride throughout the winter, then some cold weather or indoor gear may be needed. Think back to last winter and what parts of your body froze first on those snowy rides. Write down some items to keep those body parts warm this winter. Or take my approach and just write down “trainer” or go cross country skiing—either way, you’ll stay much warmer. Don’t forget annual maintenance on your bike. A new chain, bar tape, shifter and brake cables and housing, and any parts that are getting worn—these add up quickly so keep them in mind. Last, that team clothing order always seems to surprise to me. So keep in mind that those are often placed in the late fall or early winter, and take account of what clothes you need and want for next year. Shorts, jersey, some matching arm warmers, a thermal jacket—they all sound totally pro but add up quickly so think about what you wear while riding 95% of the year. With new wheels, parts, tools, clothing, and much more, you’ll probably find you have quite a lot on your wishlist. So get to work making that dream a reality. Start paying attention to end of season sales, give a few hints to your spouse, parents, or rich uncle, and don’t forget my mom’s great Christmas trick: the “To me, from me” gift. As the end of the road racing draws near, hopefully you look back and feel like it’s been a good season. You may even be thinking that next season you’re ready to move up from a category 5 to a category 4, from a 4 to a 3, etc. But how? Each USA Cycling licensed racer has a separate category for road, track, and cyclocross. Upgrades for each discipline follow a separate set of guidelines based upon experience and results. As a new racer, upgrades are based mainly on experience, with the goal that cyclists advancing to the next category have the skills and fitness to be safe in the higher category. At higher categories, riders move up based upon results in their races. While the official guidelines are a good measure of a rider’s potential for an upgrade, you may find some riders upgrade even if they don’t meet the official criteria. These exceptions can happen for many reasons—good and bad. If you have questions about your particular situation—or are eligible and want to upgrade—contact your Regional Coordinator. You’ve probably had it happen before: you’re enjoying a nice ride when a car drives by with a passenger yelling at you about getting off the road—or something less friendly. It’s annoying and interrupts a pleasant ride, but at least it wasn’t this disastrous situation. Whether it is to avoid getting a ticket, defending your rights, or simply staying in the good graces of drivers, it is a good idea to know the actual laws about cycling on the highways and byways. These laws vary in every state—even different cities—so it is important to know what the local ordinances say and learn the new ones when you move or train in a new region. In Michigan, the League of Michigan Bicyclists provides helpful information, including their What Every Michigan Bicyclist Must Know guide, which provides a nice introduction to basic Michigan traffic laws. But nothing beats going straight to the source. It is now relatively easy to find the traffic code for each state online. From the Michigan Vehicle Code, Act 300 of 1949, Section 257.657: Operation of Bicycles, Motorcycles and Toy Vehicles: “Each person riding a bicycle … upon a roadway has all of the rights and is subject to all of the duties applicable to the driver of a vehicle….” Keep that in mind, and you’ll get the sense of your rights and duties as a cyclist. If you are interested more broadly in the topic of cyclists and the law, VeloNews’ column Legally Speaking—written by two-time Olympian and 1990 National Champion Bob Mionske, now an attorney focusing on bicycling—is a great resource to learn about issues involving cyclists and the law. His book, Bicycling & The Law, is another excellent resource. While it is good to know your rights and responsibilities as a cyclist, it is also good to keep in mind that staying safe should be your main goal. And in order to do that, “Obey all stop signs and signals; motorists get upset when cyclists ignore traffic laws” (League of Michigan Bicyclists’ What Every Michigan Bicyclist Must Know). An upset motorist is never safe for a cyclist, whether it is you today or your friend tomorrow.